Team TokuNet Social Media Manager Amber talks about her experience at Japan World Heroes 2017, a tokusatsu fan convention hosted from August 25 to August 27 in Pasadena, California. Japan World Heroes 2017 was packed full of everything a tokusatsu fan could ask for: toys, rare collectibles, informational panels, and beloved industry guests. The convention opened for a preview night on Friday with everyone ready to snag merchandise. The main convention floor showcased vendors like Sentai Jackets, Japan Hero Collectibles, and Anime Jungle along with various artists like former featured artists Matt Frank and Mark Marella. Fans were excited to meet tokusatsu guests: Kamen Rider W‘s Renn Kiriyama; Gaoranger‘s Noboru Kaneko; Ultraman‘s Bin Furuya; legendary Super Sentai suit actor, Hirofumi Fukuzawa; Ultraman Great‘s Dore Kraus; Godzilla motion capture artist, TJ Storm; and Fujiyama Ichiban‘s Michi Yamato. Each guest had a Q&A panel where audience members could ask them questions related to their roles. In Kiriyama’s panel, he talked about what the audition process was like for Kamen Rider W while Furuya taught the audience how to properly pose like Ultraman. During Kaneko’s panel, he described his experiences filming Gaoranger and Fukuzawa showed everyone various Sentai roll calls. During the weekend, the convention hosted various cosplay gathering where cosplayers could celebrate the characters and shows they loved. Many of the cosplayers talked about working on their costumes for months leading up to the convention. 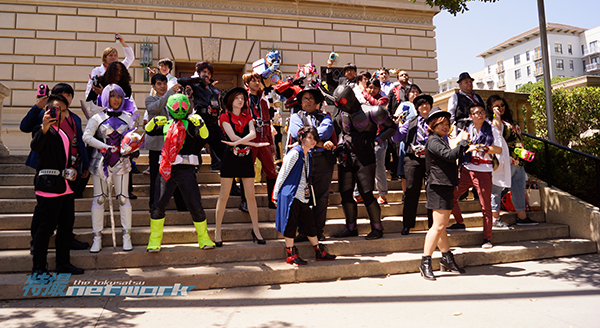 All types of fans were able to enjoy the cosplayers’ efforts and even Fukuzawa stopped by to take pictures during the Kamen Rider cosplayer gathering. On Saturday afternoon, the convention hosted its first cosplay contest and cosplayers were able to compete for awards. Each cosplayer was given a chance to show off their costume and talk about how they made it. Everything from Kamen Rider to Super Sentai and Ultraman was represented during the contest. As the resident cosplayer at Team TokuNet, I competed with my original Space Sheriff Gavan cosplay and won second place. Seeing the hard work of each cosplayer and the passion they put into their costumes showcased how much tokusatsu is loved amongst its fans. On both Saturday and Sunday, Team TokuNet hosted panels: Tokusatsu 101: An Introduction to the Genre, Spider-man’s Giant Robot: The Japanese Origins of Power Rangers, and Beyond Super Hero Time: Metal Heroes, GARO, & more. Tokusatsu 101 served as a way for fans to learn more about the origins of tokusatsu and important historical moments in the industry. The Japanese Origins of Power Rangers taught fans about Toei’s Spiderman show and the origins of Super Sentai with special guests Michi Yamato and Hirofumi Fukuzawa to talk about their experiences with Toei and Power Rangers. Lastly, Beyond Super Hero Time shined a light on lesser known tokusatsu shows like the Metal Heroes franchise, GARO, and much more. Slides from these panels will be available exclusively to our Patreon supporters. For its first convention, Japan World Heroes successfully excited fans and gave everyone the opportunity to share their love for tokusatsu. The next Japan World Heroes convention will happen in 2019 with dates and location to be announced in the future. This was my first convention experience and it was worth it to go. Me dressed up as kamen rider ichigo was like an out of body moment for me. Made a lot of friends along the way and saw a lot of youtubers and tokuactors that I came across. It was an awesome time to go and sometime I hope more people would go to this .